By Sia in Internet. November 1, 2016 . If you travel a lot, one of the sore points of travel is the availability of Internet access. For most of us, we fall back to the airport WiFi for our pressing needs, at least until we can secure an alternative at our destination. I’m sure you can understand the need for a map that lists down all the passwords to Airport WiFi access all over the world. Created by Anil Polat, this map marks many of the airports found across the world with a plane icon. 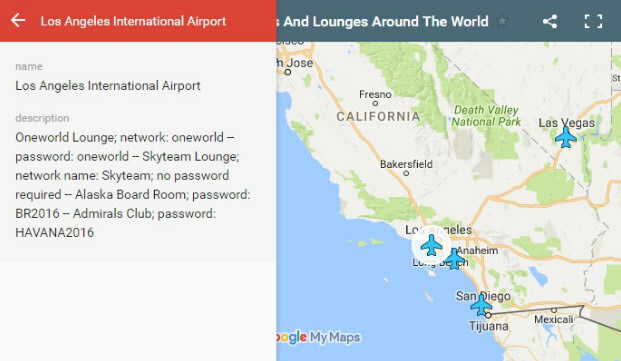 Click any spot and you get the passwords you need to certain Wi-Fi hotspots in the airports there. Besides information on airport WiFi, the list also includes lounge-specific hotspots and even cafe hotspots. The passwords are crowdsourced by the public, so it is constantly updated. That said, this also means that the map doesn’t mark all the airports in the world — only those with known passwords or hotspots. Polat’s little map is a very handy tool for frequent travelers. Feel free to check out the tool and contribute to the map as well. Either way, Polat would love to hear from you.